We are a volunteer-based organization. 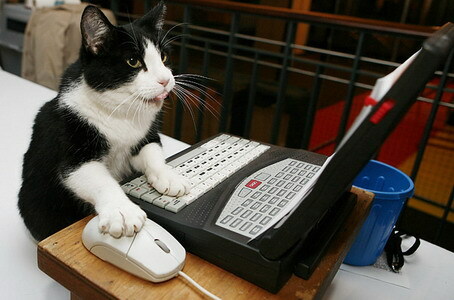 We have opportunities for people with computer skills (hardware, networking, Linux/Apache, PHP, MySQL), HTML skills, editors, translators, photographers, people to help maintain the Connexions directory of associations, people to help develop our online archive of social change materials, and people with fundraising and marketing skills. Connexions is located in downtown Toronto. Phone: 416-964-5735 or use this contact form. Some tasks require coming in to the office; others can be done remotely via E-mail and Internet. We need volunteer(s) with solid computer skills to help us with troubleshooting and trouble-preventing (maintenance) as well as with sustaining and improving our (Linux) servers. Knowledge of Linux, PHP, MySQL, and HTM would be valuable. If you have skills and experience with MySQL databases, PHP, Linux, server administration or related areas, we can use your help. We need help with our website, ranging from page design and redesign, to turning electronic text into HTML pages for the website, to tweaking and improving existing pages on the site. We also need help from time to time with designing and producing print publications and promotional materials. As an Associate Co-ordinator you would assist the Co-ordinator of the Connexions project (comprising a website with thousands of documents, as well as a physical archive of books and documents). Previous experience in this kind of work is an asset. This might particularly suit someone retired from an administrative or managerial position with a non-profit organization or an advocacy group. By volunteering with Connexions, you will be part of network of people who believe in the value of knowing the history of social movements, and in the importance of sharing the experience and knowledge of elders, and of people who have passed on, with the citizen activists of today and tomorrow. Connexions maintains an extensive calendar of social justice and activist events in Canada and beyond. We need help in adding events to the calendar on a regular basis. You could take on dealing with events from a particular geographical location, or concerned with a particular issue. It isn't necessary to do this from the Connexions office (though you're welcome to come here if you live in Toronto) since it's done via an online form. If you're interested call the number at the bottom of the page or send an email to the email address at the bottom of the page. Helping to plan, co-ordinate, and implement fundraising and marketing strategy and priorities. Connexions offers a four- to six-month unpaid internship as a Marketing or Fundraising Intern. Responsibilities may include copywriting, phone surveys, market research, prospecting, networking, attendance at meetings and trade shows, and helping to produce customer newsletters, Web pages, and other marketing materials. You will gain experience in a range of marketing tasks, working for an organization focused on producing services and publications for and about the news media, and for organizations looking for media attention. You should have a flair for copywriting, an interest in the news media, an awareness of current events, and a desire to gain marketing experience. Computer and Web literacy are important attributes. For individuals with interest in the project but with less time to commit, part-time volunteer positions are also available. The Connexions office is in downtown Toronto. To apply or for more information, call 416-964-5735 or send an E-mail to the address at the bottom of the page. This is an opportunity to gain hands-on experience in co-ordinating and organizing a wide range of responsibilities. This could be for you if you are a well-organized, energetic self-starter and team player. Call 416-964-5735 or use form to send a message. To assist with a variety of office tasks, especially data entry and typing. At present, we especially have a need for help with typing selected social justice materials to get them into digital form. Connexions offers a four- to six-month unpaid internship as an e-Archivist: working on developing a Web-based electronic archive of alternative publications and resources. The project involves the digitization and e-publishing of print materials produced by activists, organizers, and community groups. Materials being digitized include newspapers, newsletters, posters, flyers, and other printed materials. Responsibilities include scanning materials, including OCR scanning of text, proofreading, conversion of materials into HTML and PDF formats, page design, subject indexing, abstracting, link creation, research, copyright checking, and correspondence. You will gain solid experience in working with an information clearinghouse with a 37-year history of compiling, preserving, and publishing materials concerned with social justice and activism. You should have enough relevant education/experience to feel comfortable with this kind of work, a near-obsessive concern for accuracy and detail, an excellent command of English, and the ability to work well with others. A sense of humour always helps. To apply, or for more information call 416-964-5735 or send an E-mail to the address at the bottom of the page. Connexions maintains an online archive of documents which it aims to make freely available in several languages where possible. Translators are needed to translate documents, and terms in our comprehensive subject index, from English into other languages. The greatest need is for English-to-French translation. Also needed are translators able to translate from English to German, Spanish, Italian, Portuguese, Dutch, Danish, Norwegian, Finnish, Polish, Swedish, and possibly other languages. We are still working on developing the ability to display non-Roman character sets (e.g. Chinese, Arabic, Farsi, Greek, Japanese, Korean) on our website. Anyone with experience in doing this on a Linux server would be much appreciated. 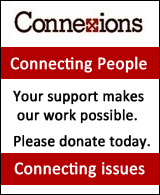 We welcome writers, reviewers, and editors to contribute content to the Connexions Web site. We abstract and review a wide range of books, periodicals, and other materials related to social and environmental issues. We are particularly looking for people to edit, revise, and improve encyclopedia-style articles for Connexipedia. We are also looking for section editors to help find and select articles and resources for the Focus sections on the Connexions site. These are clusters of resources, articles, websites, current news, etc. focusing on particular subject areas such as civil liberties and human rights; environment and sustainability; media for social change (including both alternative media and how to make use of the mainstream media); gay and lesbian issues; First Nations/Native Peoples; journalism and writing; women's issues; urban issues; sexuality; and Palestine/Israel. We need editors with good political and editorial judgement to select current and archival content for these sections. We try to include an image of book and magazines covers with their bibliographic records in the Connexions Library/Archive. This involves scanning the cover and saving it as a suitable image for online. We are also continually scanning photos, flyers, posters, and other images. Work on adding information about recent and current documentaries, as well as film projects from the past, such as the Workers’ Film and Photo League of the 1930s, the Newsreel project on the 1970s, and films distrubuted by DEC films in the 1970s and 1980s. A quick overview of Connexions’ origins and development. What Wikipedia has to say about Connexions. Call Connexions at 416-964-5735, or use the contact form, or send an E-mail to the address at the bottom of the page. Keywords: Internships, volunteering, Toronto, volunteer opportunities, social justice, environment, international development, writing, editing, research, marketing, networking, alternatives, human rights, civil liberties, translation internships, website interns, Canada.